The Brighton duo known as Blood Red Shoes have spent years refining their sound. Since their 2008 debut Box of Secrets they seem to have been taming their ferocious punk rock influenced songs. Now back with their third full length album, Steven Ansell and Laura-Mary Carter seem to have found the golden middle road. In Time To Voices is a cohesive album that combines Ansell and Carter’s love for distorted, aggressive punk and more quiet pop numbers. Two words that seldom go well together are pop and punk, but Blood Red Shoes makes these antonymes fit perfectly. Their new found balance is evident on lead single “Cold.” Combining Carter’s softer vocals with Ansell’s rougher half screaming, half singing adds a powerful dynamic to the song. The song is built around some very groovy drums, uncommon to this duo’s previous work, laden with a straight and powerful bass that adds even more power to the aggressive guitar riffs. 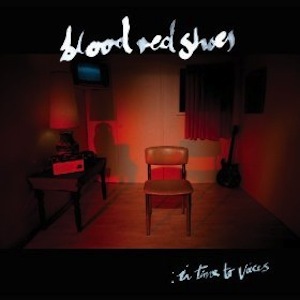 The musical progression is as evident as one would expect from a band of this posture, yet Blood Red Shoes reveals no growing pains. This band has grown up in style, avoiding the musical landmines that many have encountered trying to expand an already vibrant sound.